The first Chicago ordinance, and in fact in the entire United States, was passed on July 6, 1899, requiring an annual automobile operator’s license which expired one year from the date of issue. A Board of Examiners was created, made up of the City Electrician, City Engineer and Commissioner of Health, to assess each applicant’s physical and mental acuity to drive. Upon passage of the 18-question exam, the license fee was $3, which could be renewed for $1 per year thereafter, and a paper “certificate of qualification” was issued. Upon the recommendation of the City Electrician, the ordinance was amended on January 28, 1900, to require a small numbered badge to be issued by the city in addition to the paper license. This badge was to be pinned somewhere onto the driver’s clothing or hat. Four different shapes of undated badges are known, and probably represent different years. A 1903 city auto license. The Horseless Age reported on May 6, 1903, that more than 1,050 automobile licenses have been issued. 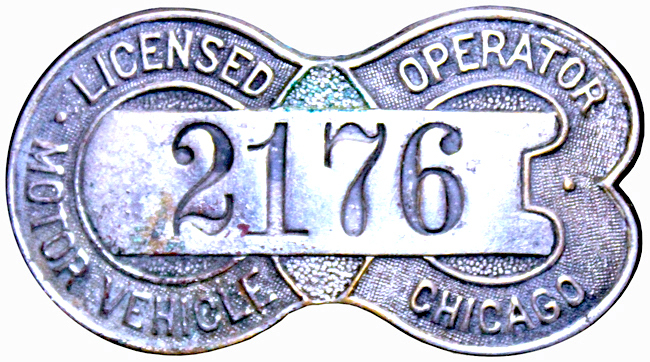 On May 1 City Electrician Ellicott transmitted to the chief of police a cut of the new badge (above), with orders for the arrest of everyone operating an automobile without a 1903 license and badge. 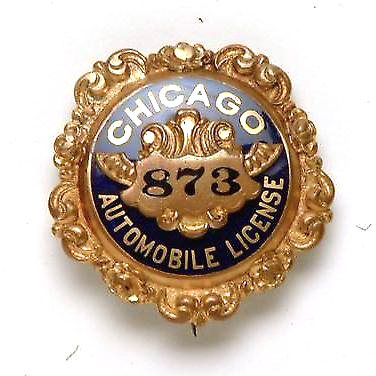 The base of the new badge is a gold wreath in relief, on which is a royal blue enamel plate with the words: ‘Chicago Automobile License.’ On this is a gold bar with the number in black, held by a pair of wings surmounting a shield in scroll. Back in 1901, when roads were either muddy or nonexistent and fewer than a thousand automobiles competed for parking space in the Loop, Chicago already had begun to license the vehicles, John C. Marcin, city clerk, disclosed yesterday. The car owner didn’t stand in a six-block queue around City hall for the privilege of purchasing a windshield sticker. As a license he received a little enamel button to wear on his duster. It bore the words “Chicago Automobile License” and a number. Motorists had to make their own license plates—usually of wood tacked to the body of the car. The same numbers as on the buttons were painted on the plates. City officials can find no record of what a city auto license cost in 1901, but two types of auto licenses were sold in 1902. Class A licenses were $5 and class B licenses were S2.50, depending on the weight of the vehicles. Marcin’s office is selling new 1965 stickers, by mail or over the counter, at fees of S15 or $30, depending upon a vehicle s horsepower. The nominal deadline for purchase is Jan. 1. Two of the early-day license buttons recently came to the attention of Marcin. One was brought in by a former Chicago resident who said he had purchased it from the city in 1901, and the other turned up in an assortment of political buttons purchased by a Chicago coin dealer. Marcin said the buttons, both issued in 1901, were the earliest ones discovered by his office. “We have another button but we don’t know the date,” he said. Mlarcin said it Is believed the city started to license autos in 1895, but said there are no records available to verify this view. The city abandoned the duster button in 1904 or 1905, and started issuing a 5 by 12-inch stamped brass plate wrapped over steel backing, Marcin said. The state did not issue plates, he added, until about 1910, when the city began issuing tags to be nailed to wooden parts of the car, Marcin added. In 1956, the decals were printed on material in which the numbers disintegrated when removed from the windshield. Marcin said the former resident promised to send him the little duster button as a relic to add to the city’s early auto license tag collection.